As a part of an international co-operation project, eLearning materials have been created for adults working in the retail trade. TAMK University of Applied Sciences was involved in the design of the materials as an expert in adult education and on-line education. The partners included two Icelandic and one Scottish educational institution and the work was mostly financed by the EU Leonardo da Vinci transfer of innovation programme. 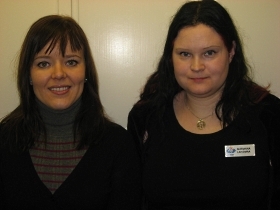 Senior lecturer Hanna Torp (left) and project manager Marianna Leikomaa of TAMK University of Applied Sciences have developed new eLearning materials designed for adult students in the retail trade. During the development, existing learning materials were transferred into an on-line learning programme. This enables the workers to upgrade their expertise alongside work. The workers also become familiar with the Internet-based tools on the retail trade whose use is constantly on the increase. Adults, with a great deal of work experience, want to begin learning new things by sharing their own and their peers’ experiences. This is made possible by the on-line material: students learn by working both independently as well as interactively sharing the work they produce with the other learners through, for instance, video conferencing, Wiki and discussion tools. The learning material supports the employees’ lifelong learning. The studies help them to identify their own strengths better and they acquire up-to-date formal competences on the basis of their existing expertise in the retail trade. The eLearning material encourages adult students in the retail trade to utilize on-line tools; for example, the latest news, which can give an employer a competitive edge, can increasingly often be found in blogs. The Icelandic and Scottish partners on the project carried out a needs analysis of adult education in the retail trade. The learning materials consist of 35 credits offered in 9 modules; for example buying and selling, financing, information technology, administration and marketing. The entire content is aimed to be completed in two years of part-time study, but the modules can also be taken separately. Various features of the European retail trade were incorporated into the internationally developed learning materials. The materials aim to strengthen adult students’ knowledge of international retail standards and practices and thereby enhance the international competitiveness of the worker and the retail trade. Language versions of the materials are being produced in English, Icelandic and Finnish and they will be completed in January 2010. The project has been implemented as a part of the R&D functions at TAMK University of Applied Sciences. In light of their good international co-operation, the project partners are interested in a further project creating new eLearning materials for adult business students.